When it comes to classic pairings, jazz and brunch go together as well as wine and cheese. A big part of this combination derives from a rich cultural background with strong historical ties stemming from New Orleans. 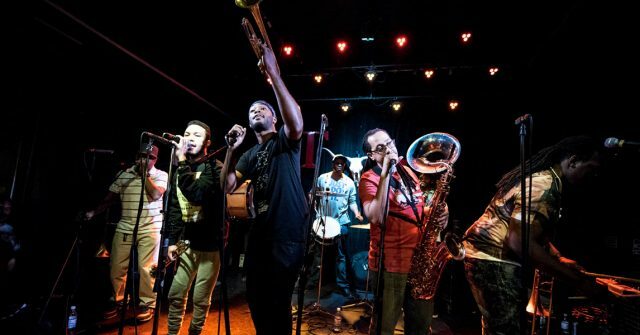 And a prominent piece of that history makes its way to the Dakota later this month as Rebirth Brass Band gives Minneapolis a little taste of The Big Easy. Brunch became popularized in New Orleans back in the 1940s at a point in time where the city and the surrounding area was beginning to grow. As restaurants specializing in big dinners began to take off and attract tourists from outside the area, some restaurants looked for a unique, affordable way to offer a new take on breakfast and lunch. Restaurateurs like Elle Brennan started bringing in jazz musicians to soundtrack patrons’ late-morning and mid-afternoon meals, adding a special pizzazz to their dining experience. With jazz firmly cemented as a New Orleans staple by the 1950s, neighborhood spots all around the area started hosting brass bands of all shapes and sizes. This marriage of food and music only opened the door even more for upcoming musicians, and by the time the 1980s came around, Rebirth Brass Band was starting to take shape. Founded in 1983 by brothers Phil and Keith Frazier along with Kermit Ruffins, Rebirth Brass Band started off recording their debut album, Here to Stay!, in the Tremé neighborhood bar called the Grease Lounge. They eventually made their way to host a longstanding Tuesday residency at the Maple Leaf – a regular gig that they still hold to this day – before gaining worldwide recognition by touring the national and international music festival circuit. In terms of sound, Rebirth Brass Band combines the traditional brass jazz sound with traces of funk, afrobeat and hip-hop, as well as certain elements from marching bands, which was a big influence for many of the group’s original members. It’s a style of music that is easily accessible by people of all cultural backgrounds. And its influence stretches far, reaching everything from hip-hop acts like The Roots to the next generation of New Orleans’ jazz musicians like Trombone Shorty. Nearly everyone can sift through this layered sound and find something that sounds familiar.